Based on the 1985 manga created by Masanume Shirow, Producer John Woo and director Shinji Aramaki combine talents to bring to live once again these magnificent franchise to its second CGI movie installment. Appleased EX Machina had brought these splendid story to a whole new levels, with impressive details, action sequences, and a brilliant story that certainly outdoes its predecessor. The great thing about the movie is that it is not targeted to any specific audience, people not knowing about the original story, or the first movie, as well as returning fans will not be disappointed with this mesmerizing adventure. The movie is rated PG 13 for action/violence and strong language, and will be available on March 11 2008. It is the year 2031, the remaining survivors of the third non nuclear world, biological engineer being Biorods and cyborg robots have managed to set their differences and live in peace in the utopian metropolis of Olympus, ES.W.A.P agent Deunan and her cyborg partner Briareus are there to make sure that peace is not disrupted, Until an stealth attack on the cyborg them aware of a possible terrorist threat. With the attack, Briareus is severely injured and a new partner is assigned to Deunan, a Bioroid named Tereus, which is engineer from Briareus’ DNA, so not only Deunan has the pressure to solve the case, but also a sentimental tension to cope with her new partner. Soon she discovers that the threat is going far beyond cyborgs, it is targeted to the whole population and can be the cause for another world war, and that it is going to take exceptional teamwork and trust in each other from this trio to stopped. 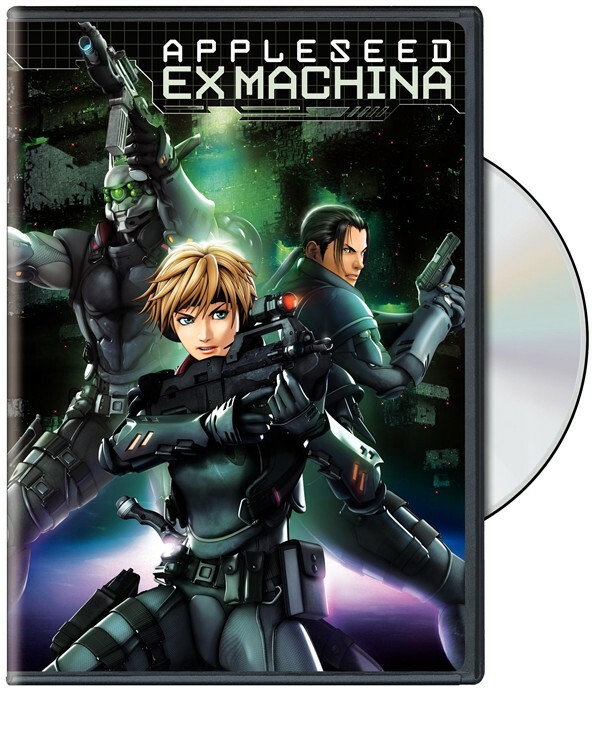 Appleseed EX Machina evolves from its original film in all aspects, this time the animation, sound, action sequences and music are better and more pleasurable to the eye than the first one. There is not doubt that there is a contribution from John Woo in this film: the marvelous gun fights, the camera angles, and the focused on detail are just examples of this contributions, This plus the geniality of Aramaki in preserving the distinguish characteristics from its original version creates a wonderful world that is not just pleasing to the eye but also in stimulating in all the senses. The CGI animation improved drastically from the first film, the characters looked more realistic and less cartoonist, facial expressions body movement, and emotions are better depicted, not only for the human characters but for the cyborg and biorids as well, and the cities and environment although futuristic and imaginative give also a more sense of realism making the audience relate to them. Nonetheless, it could have been much better, since in some scenes it looks like you are watching a cut scenes from an old 32-bit video games. Character design was done incredible amazing specially in the non human characters, the emphasis in detail is successfully used, in most of the scenes, you could see the screws and nuts and these will not disappear in the next frames. Sound and action sequences are skillfully picked, the sound track helps the audience to get in the mood for the movie, and the fights were exceptionally choreograph. Appleseed EX Machina is without a doubt a most have for anime fans, its storyline script and plot are as appealing as popular anime Ghost in the Shell. It has all the right elements to entertained young audiences like robots, action, and friendship, at the same time it touches issues that will captivate a more mature audience like politics, ethics, love, and mythology. There is no mistake that the war between man and machine is an interesting theme for Sci-fi movies, movies like Terminator, iRobot and The Matrix are example of its success, nonetheless in Appleseed, we also see a point of view where is not man against machine instead it is a mutual cooperation between them to fight a bigger problem: crime, this and the different styles used makes Appleseed an instant anime classic. SPECIAL FEATURES: The DVD comes with a basic menu of special features, nothing special in this section, keep in mind that the movie is what makes the DVD worth, however for many fans of anime the features might result instructive. Appleseed is a great movie to watch. If you loved the series on Cartoon Network (Yeah I was a fanatic for watching stuff on Cartoon Network) than you'll love this movie. The features are great and the action scenes are totally out of this world. I would recommend people to watch this movie. If you love Japanese anime than add this one to your collection.